We've left San Mateo County for tiny San Francisco County at the top of the peninsula. Besides the Bay Bridge and the Golden Gate Bridge there are just a few other iconic bridges in the county. 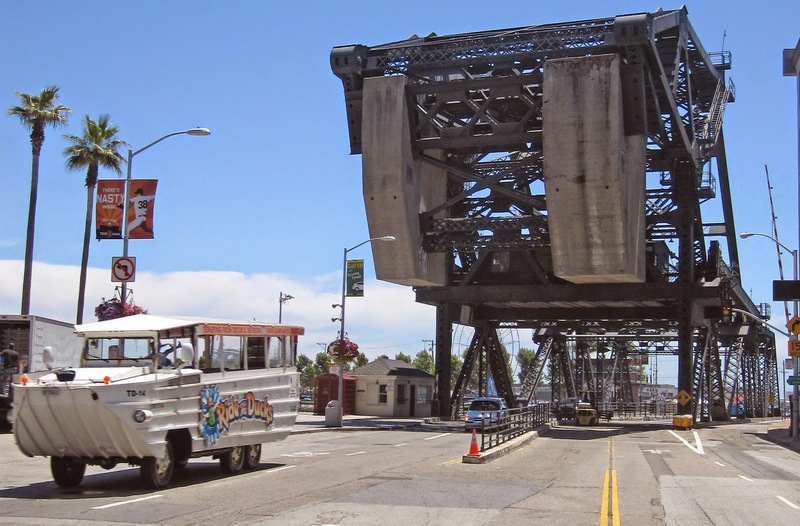 Four interesting bascule bridges are located on the east side of San Francisco along the Bay. The Third Street (Lefty O'Dowd) Bridge (34C0025) is next to the AT&T Baseball Park in China Basin. It's a Strauss Heel Trunion Single Leaf Bascule Bridge that was built in 1932. These bridges are interesting to watch open and close. In order for the leaf span to be lifted high in the air, the arms that hold the counterweight fold up and rotate the weight out of the way of the approaching roadway. There are several nice videos on Youtube showing the bridge opening and closing. The bridge also has an unusual split counterweight. San Francisco County, California Bridges: Third Street Bridge across China Basin by Mark Yashinsky is licensed under a Creative Commons Attribution-NonCommercial-NoDerivatives 4.0 International License.